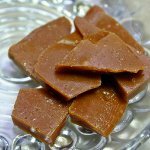 You may not know it, but January 8 is National English Toffee Day. If you like this treat or candy, then why don't you celebrate this day? There are many theories about the origin of toffee. As far as similar candies were made in different countries it's hard to say where it appeared for the first time. In 1845 the word “toffee” came into the Oxford English Dictionary that gives us the hint that this treat existed before that. The origin of the word “toffee” is also unclear. Some food historians consider that it comes from “tafia”, the Indian rum that was often used to cook many types of candies. Others believe that the term comes from “tuffy” or “toughy”, that means that the candy could relate to chewy dessert. Traditional English toffee consists of butter, sugar and water. Its texture can vary from sticky and soft to brittle and hard. Sometimes toffee is coated with chocolate and nuts. Although these are not the part of the original recipe, they make taste of toffee better. The other English toffee is made of almond butter. These candies go in different varieties and known around the world.